Thread: Views on using middle finger for braking. I picked up this habit and now I can't get rid of it. When I go back to using my first finger, I don't feel like I have enough of a grip, I can't properly jump the bike, I can't take the really rough stuff, and I can't feel the brake modulation properly. I've tried a fair bit to correct myself. So, what do people think of using the middle finger to brake? Is it better to use first finger to get the elbows out a bit more, or what other benefits do I miss out on. Is it going to affect much the level of riding I will be able to attain to? I'm just about ready to race in the national downhill series here. I'm using Hayes 9 brakes, 8" with ebc brake disks, on a Yeti Asx in 6.4" mode, with 7" RS Boxxer 2004 WC forks. Geez you can hang on, shift and brake at the same time. Middle finger braking is a very bad habit to start. I would try to use two fingers at 1st and eventually ween yourself off the middle. Perhaps even get some Dangerboy levers. I think I'm missing something here. If the OP is braking with his middle finger only, won't he still have three fingers (plus thumb) holding the grips? Pointer, ring, pinky (plus thumb)? And you do not need to have your elbows "out" to ride well. It is the way to go no doubt....those that get sore fingers, probably don't exercise the middle finger as often as they should. I use my middle finger all the time. I don't think that the fingers are totally movement independent, and using the middle invites dependence on both fingers (index and ring) that are gripping. From experience, using only the middle seems to give me less grip on the bar and less control of the brake lever. So you only use the pointer to brake with.....rather than the pointer and the middle? Cause if your using two fingers you well have less grip power on the bars, regardless of what it feels like. Maybe, but I have tried it and it doesn't feel right to me, and after thinking about it, it seemed to be that there is an interdependence. It isn't all about grip. Your middle brake finger loses control if if the pointer and ring are gripping. The gripping finger loses grip power if the finger next to it isn't gripping. I was just googling finger dependence, and there does appear to physiological dependence that is greatest for the middle fingers. I use index for light or index + middle ... mostly index + middle when down hilling. I will weigh in just because I am forced to use my middle finger for braking with most brake levers. I an missing about a 1/3 of my index finger (just past the first knuckle) from a farm accident. Its just enought that I can't get the "nub" around to lever. The only levers that I have really been able to really use the nub with are Hayes Stroker Trails. The lever throw adjustment combined with the ergonomics make it my top choice. However it took me a couple of years of middle fingered braking to find strokers. I also primarily ride a rigid SS so I place a lot of importance on being able to hang on to the bar. Middle finger breaking seems ridiculous in my opinion. It really takes a lot of strength away from your grip. One finger - index, all the way. An easy way to demonstrate is to face and grab a handrail at almost arms length and whilst gripping, pull your hand up and backwards and lift your index finger, put it back, grip, then try lifting your middle finger. It's instantly noticeable when you lift your middle finger that a strain occurs on the underside of your forearm that is not apparent when you lift your index finger and the grip is compromised. I do not brake with my middle finger, but I do place them on my brake levers when seeing a group of roadies on the way to a trailhead. For whatever reason I use my middle finger on my right hand and alternate from index and middle on the left. Don't do it on purpose. I have zero problem with grip, if anything it's better with the middle finger. 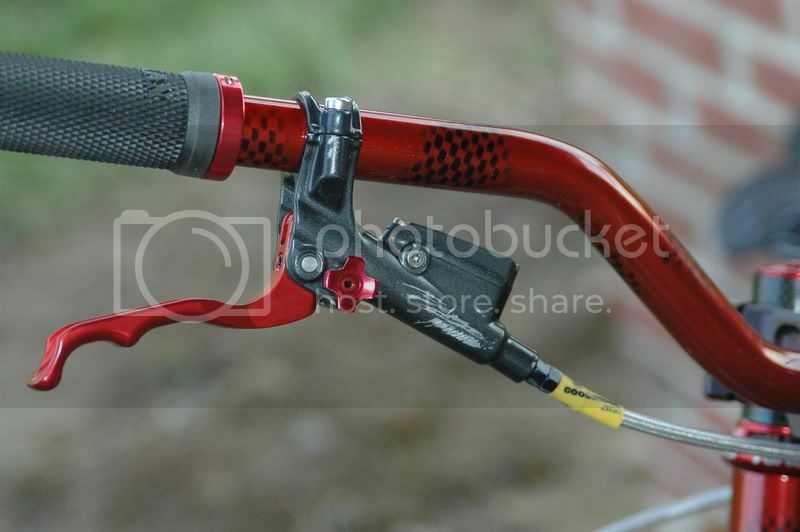 It's longer and seems to naturally reach the brake lever easier while the others are gripped tightly. Plenty of modulation. Maybe it's because I have played guitar for 15+ years, but it seems more natural. Gripping pick with right hand and middle finger extended and just more individual dexterity. He would still have 3 finger gripping but I found that if you grip with your middle finger your index finger has a lot less gripping stregth. At the cost of less brake control. Hell you probably can't even do a Vulcan salute....BTW actually some sort of Jewish thing. Not BS. You guessed wrong. I can do the vulcan salute at will with both hands. I am a guitar player. I have tried riding middle finger, and it is awkward. 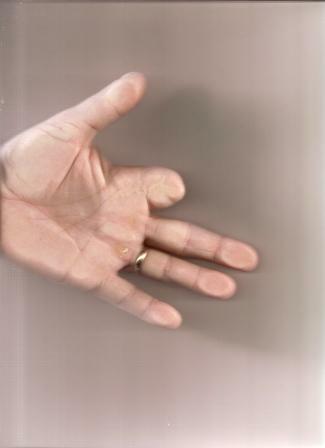 I noticed dependence between fingers, and there are studies that confirm it ... especially for the middle. Finally, I am speculating that there are reasons most riders do not ride and brake with only their middle finger. I did a lot of riding using the middle finger, but then I went to use the first finger and I feel I have better grip on the bike. The plus side I have now is if I get tired of using the first finger, I can go with the middle for a while to rest..
Glad I don't have to listen to you playing a guitar with a wonky middle finger. 5 out of 6 of the guys I ride with use it. 5 of 6 of your buddies use middle finger only? More power to you guys then if it helps you ride. I have never seen anyone riding that way by choice. How courageous of you...glad you didn't crash. Did you pull the brake on or just rest your finger on the brake. I can guarantee that you will have much less control by feeling wierd/unnatural than any marginal change you'll ever get with middle finger vs index finger. I actually think its stronger and more natural to overlap your thumb and index on the grip than with the thumb and middle. "A man who goes against his nature gets constipated" Stephen King, The Dark Half. I use middle finger for braking. I'm not sure if that's developed due to my use of gripshift (where I use the index and thumb for shifting), or from having short fingers and needing the length of my middle to feel confident of reaching the levers. I've tried using index but its not good for me so I went back to middle. Last edited by AlexRandall; 12-02-2009 at 04:09 AM. Why are we putting so much thought into what finger to use while braking. Whatever feels correct for the individual is what they should use. I have my preference and the next guy his. I would imagine the muscles in your hand will adapt strength wise to any technique you prefer. This seems like a no brainer to me. I have been following this thread mostly out of amusement, don't really care too much how anyone else brakes, so long as they can keep from crashing in to me. But dude, seriously, did you really just post that on the internet for all to see? As if it's a brag-worthy skill? Wow! I about spit coffee on my keyboard reading that. That just seems like the most 'net ninja thing I've ever read. Hilarious! He made the argument that I probably couldn't, I simply countered that I could. Thanks for all the opinions, guys. Yeah, my hands are fairly small. Also, I feel that with the first finger and thumb nearly overlapping, my grip is much stronger and more confidence inspiring. Sometimes, on the real gnarly stuff my hands ache. I thought this might be the fork. I used to get real achy hands when I was using a Sherman Breakout Plus. I especially remember how bad my hands ached on this fork riding Fort William in Scotland. Then, I picked up a 2004 RS Boxxer WC. Now I get an ache just a little on very steep and gnarly sections. But maybe I should just let go of the brakes?!! I never use two fingers downhilling. There's just not enough grip on the bars then. Anyway, I get the impression there's no big problem, so thanks for that. I was a middle finger braker for a while (when I first when to single finger braking), but I weened myself off of it in favor of my index finger. I have a better grip on the bars, and I can run the brake lever much closer to the bar, because there is not another finger in the way being crushed. I would try both (give the index finger method a while) and just do what feels better.